The massive silhouette of Spiš Castle, which is one of the largest complexes of castle ruins in Central Europe covering an area of nearly four hectares, dominates the eastern skyline of the region of Zips. Spiš Castle and the cultural monuments in the nearby area were added to the UNESCO list of World Heritage sites in 1993. The castle was first mentioned in a document in the year 1120. 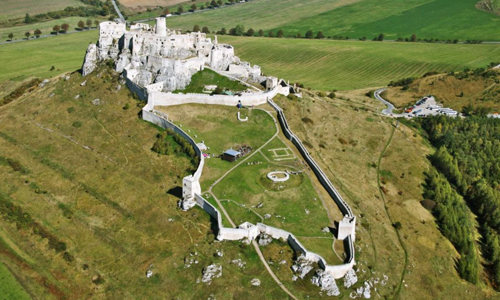 It initially served as a border fortification at the northern border of the early feudal Hungarian state. Following this, it became the seat of the Prefect of Zips for several centuries and therefore also the centre of secular power in this region. The collections of the Zips Museum, which focus on the castle’s history, mediaeval weaponry and the feudal criminal justice system, are housed in the castle complex today.